Snapper "All Year" Snook "All year" Pompano "Spring and Fall"
Cobia "Spring and Fall" Permit "Spring" Blue Runners "All Year"
Bluefish "Spring, Fall, Winter" Mackerel "Spring, Winter, Fall" Croakers "all year"
Anglins Pier first opened on November 24 1963. It has been, and still is today, an important part of the City, Lauderdale by the Sea offering tourists and fishermen a Great Time. 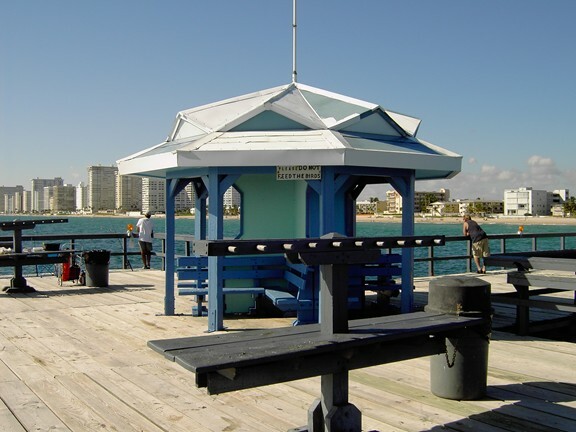 In 2006 the pier suffered damage from Hurricane Wilma and at that time the pier was only open halfway and lost what had been done from the last storm that had damaged it the year before that. The Pier, as of the Fall of 2006 is open and operating 24 hours a day. The new owners our happy to keep this Fishing pier going and will be bringing in new ideas and innovative concepts to better offer a unquie and pleasurable experience for both the Fisherman and Sightseer. They have ideas for creating ocean viewing windows through the decking of the pier while you stroll. 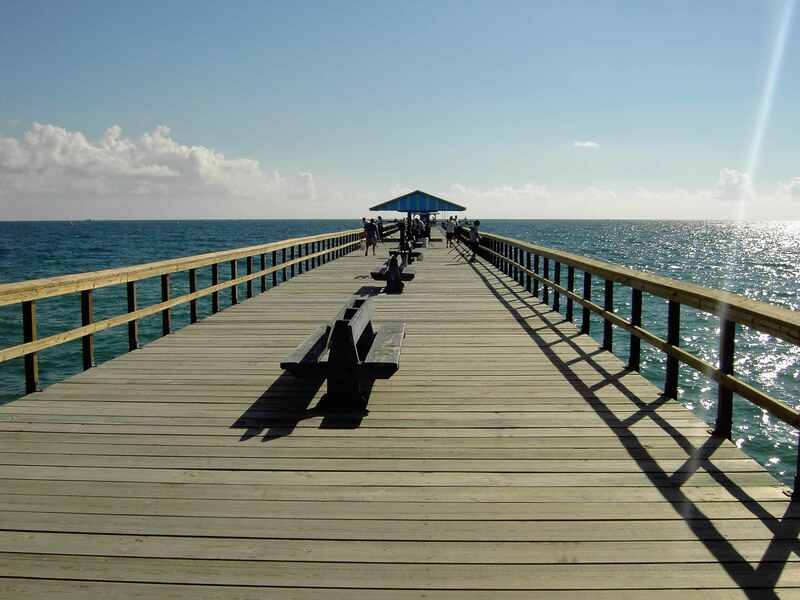 This would give the patrons the chance to look down and through the pier to see the many different sub-tropical and tropical fish that live around the pier in their habitat and also being witness to some unbelievable catches of which so many are in Awe. Anglins Fishing Pier is close to the water so if you like to use artifcials they can be worked pretty well from the height and angle you are fishing from. 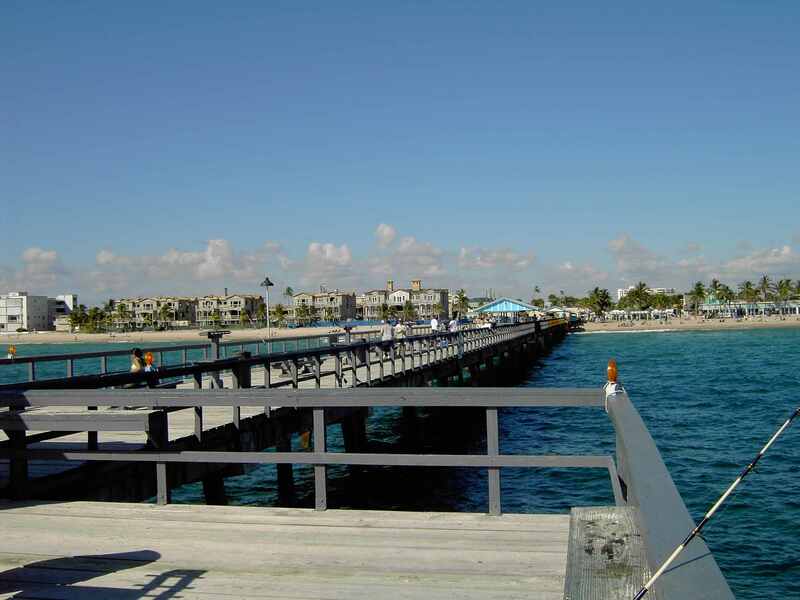 I do very well with a jig at this fishing pier for Pompano, Mackerel, Bonefish, Ladyfish and jacks. Fish-like lures I find work very well for Mackerel, Jacks, Bluefish. 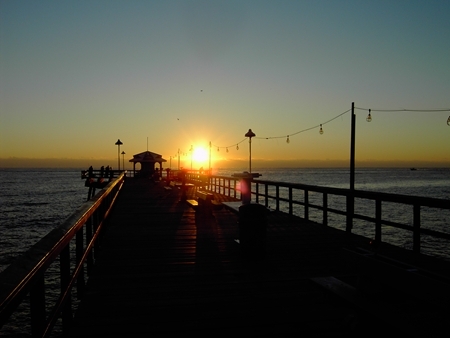 Anglins Fishing Pier offers 2 types of fishing, sand and reef "rock" fishing. From the Bait house to the middle house is sand and from the middle house out to the 'T' is reef. Beginning of pier Croakers, Gulf kings "whiting", Grunts and sometimes Mangrove snapper can be found in the first section of the pier, snook can be here also. Middle House Snook, Pompano, Permit, Snapper, Tarpon, Cobia, Bluefish, Mackerel, can be found in the section from about 4 lights before the middle house and two lights after. From the middle house out Snapper, Mackerel, Cobia, Snook, Bluefish, Grunts, Bonita, small Kingfish, Big Jacks. Typical live baits are Shrimp, Mullet, Croakers, Mojarras.